I took the day off work today to watch the stream on time for once, so without further preamble here's what I noticed after watching it twice in a row. 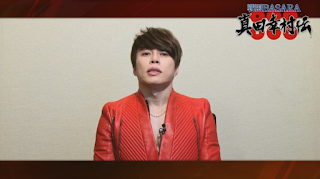 After speeding through the usual introductions and greetings, they played a short video message from Nishikawa Takanori (T.M.Revolution) then launched straight into a recap of the game information. They made a big deal of the ability to replay the audio from the story in the game's gallery, which is admittedly a very cool feature. Ayana's cool Yukimura t-shirt did not go unnoticed. The first gameplay demonstration was from chapter eight of the game's story mode (Edit: Oops, fixed a typo - thanks AZ Shibakusa!). 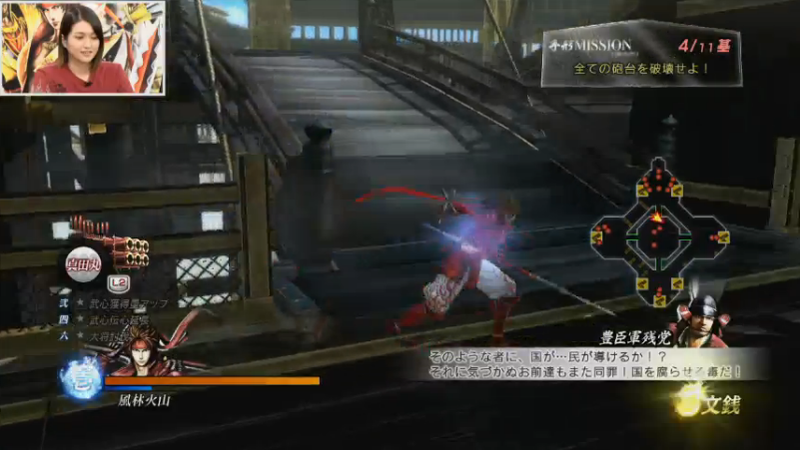 You start out playing as Yukimura but can use Sanada Blood (L2) to control the Sanadamaru fortress at any time. You hold L2 down to aim to Sanadamaru then release the button to fire the cannons. Cancelling by pressing L2 again is possible up until the weapon fires. A blue gauge around the Sanadamaru's portrait helps judge its current status; as with smaller cannons in the series, if you fire too often the weapon will overheat and need to cool down. The first objective is to destroy four cannons, then it changes to having to destroy all eleven of the cannons. The first boss is Gotou Matabee. In the stream, he showed up partway through the mission to destroy all the cannons and it seems that he can be ignored at this point. This is totally not simply an excuse to post a picture of Matabee. Once the cannons are down, Sasuke appears and Yukimura launches him into the air for the minigame where he flies around destroying supply crates. It doesn't look as hectic as it sounded from the early descriptions. KobaP called an end to the demonstration before the minigame finished so what happens afterwards will remain a surprise. Ayana expressed her initial worries about whether Sasuke was even going to appear in the game, saying that the Sasuke fans were really concerned for a while! It seems that she's a genuine fan. Next, they took a break from the gameplay and recapped the DLC oni costumes which were revealed earlier today along with some of the other past DLC announcements. 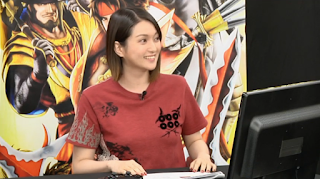 Ayana picked up the controller for the next gameplay demonstration, and while she was very nervous she took control of Yukimura in his oni costume for a run through the Tenmokuzan stage. It was her very first time playing the game - let alone live on camera - but she did a decent job. It's sort of fun that you can give all of the characters coordinating outfits for the cutscenes. Since they've demonstrated that stage several times before there wasn't much that I noticed to comment on. The next demonstration was with Benmaru on the very first chapter of the game. Both of the kids were in their mascot DLC outfits so it was hard to see what was going on around their portly bodies. They showed a fairly generous portion of the stage. 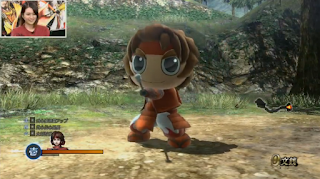 The interface indicated that Benmaru's Yukimura-kun DLC costume was his third outfit so it doesn't look as though he has any more alternate costumes as part of the base game. The first announcement in the news bulletin segment was that their LINE followers would be sent another new smartphone wallpaper illustration drawn by mangaka Itou Ryuu. It's a fun one, showing Keiji and Yoshiteru dressed up to party at a festival. The next new reveal (I'm skipping the new items we already know) was about a collaboration with Kiwa Corporation restaurants in Japan. 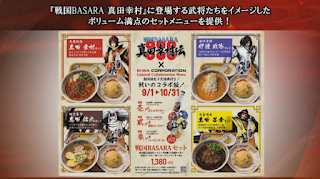 Over a hundred branches will be offering a themed Sengoku Basara: Sanada Yukimura-den menu from 1st September through to 31st October 2016. Choose from a selection of four different set meals based on Yukimura, Masamune, Nobuyuki and Masayuki, and receive ramen, fried rice, a Sengoku Basara coaster, a bottle of Japanese-style 'cider' with a Sengoku Basara label and a fortune cookie, all for ¥1,380 before tax. 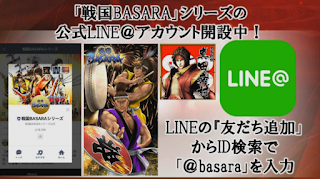 You will also receive a fortune cookie if you present your LINE account in the restaurant to show them that you're following the official Sengoku Basara account there. 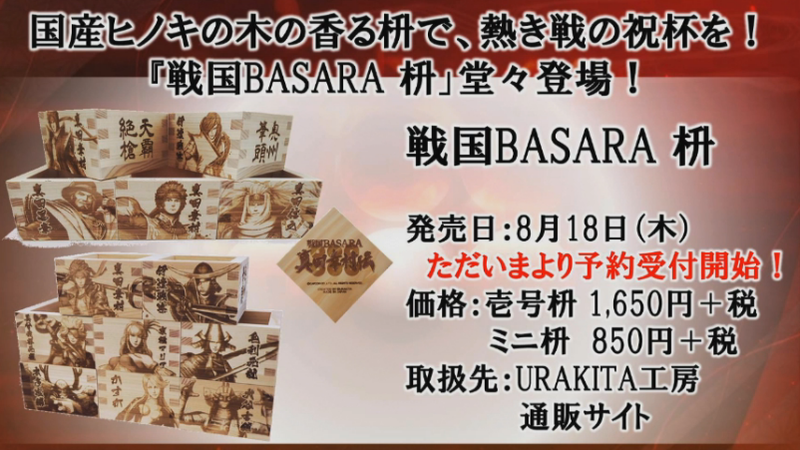 Fancy-looking Sengoku Basara masu boxes will be available from Urakita on 18th August 2016. 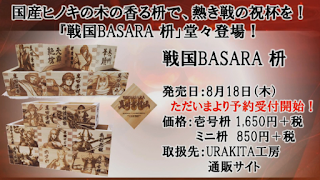 A single box will cost ¥1,650 before tax with mini boxes available for just ¥850 before tax. There's a very wide selection of character designs on offer. 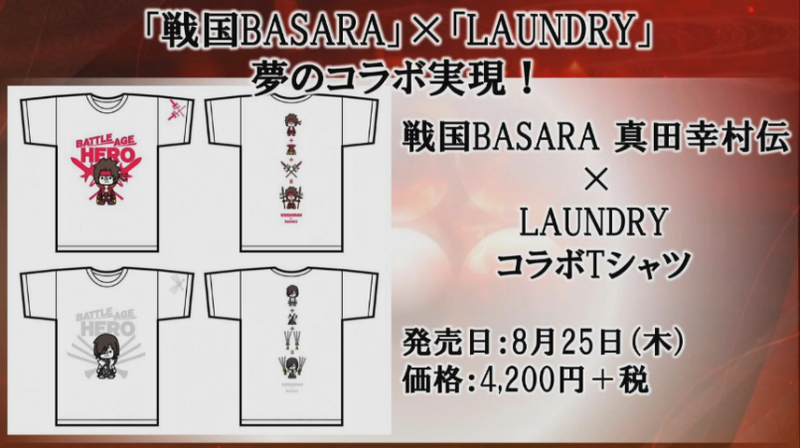 In addition, a range of designer Sengoku Basara x Laundry t-shirts is coming next week, priced at ¥4,200 before tax per shirt. And Sweet Workshop Priroll will be adding printed Sengoku Basara macarons (¥1,852) and cupcakes (¥2,000) to their range of character-themed desserts from 18th August 2016. 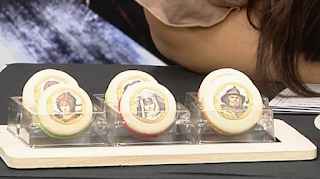 The treats come with stickers. Some samples of the cakes and macarons were available in the studio. Yummy. There will be a pair of broadcasts on Nico Nico Live on 23rd August/30th August 2016 at 19:00 Japan time. 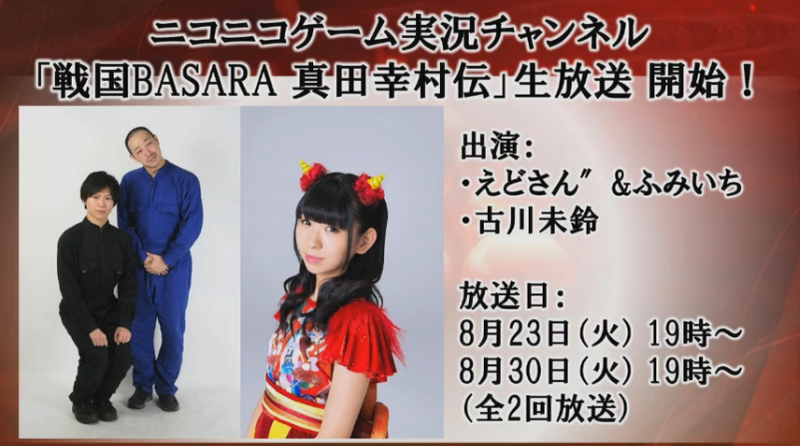 The shows will be hosted by Nico Nico personalities Edosan" and Fumiichi, and Furukawa Mirin of DEMPAGUMI.inc. 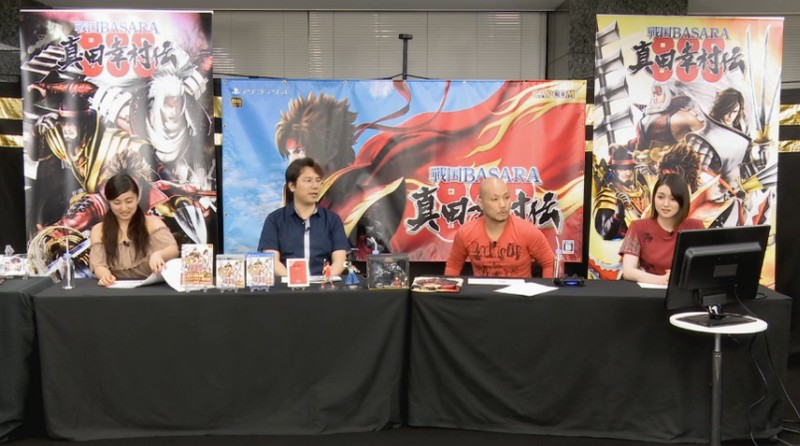 All of the presenters have helped promote Sengoku Basara previously. They showed a video clip of the Yukimura-den trains currently running in Japan as part of the news bulletins. Ayana sounded tremendously excited when Sasuke's picture passed by the camera. After a few 'final' messages the conversation shifted to how the game is being released in Chinese as well for the very first time. 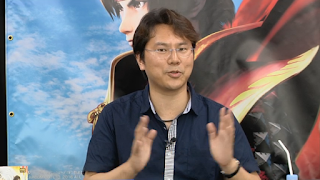 NonakaP described the trouble that fans in countries such as Taiwan have experienced, playing the games entirely in Japanese even though they had an official release over there. 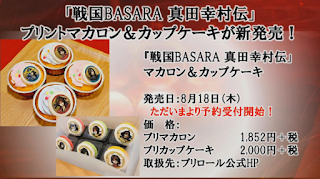 They mentioned that as well as the launch events in Tokyo (attended by KobaP) and Osaka (attended by NonakaP), there was actually going to be a third event on release day. Series director YamamotoD will be travelling to Taipei to meet the Taiwanese fans! With a final cryptic hint from KobaP that there'd be more to reveal right up to the game's release next week, the show wrapped up. Fans speculated whether the opening might be revealed online, whether there'd be another episode of the live stream, or whether it might be something completely different. Personally I think the most disappointing (and therefore most likely) answer is that it will be the promotional video KobaP mentioned before, showcasing the six food-themed weapons they've been teasing at events week by week. That's all from the live stream, but I've been thinking back on what we know about the game and I'm now even more convinced that Free Mode is hidden somewhere. The shot of Keiji on Masamune's stage in one of the promotional videos doesn't match up to anything else we've seen, and the simplest explanation is that once you've played through the main story or completed some other task, you can swap out the characters you control on story stages thereafter. 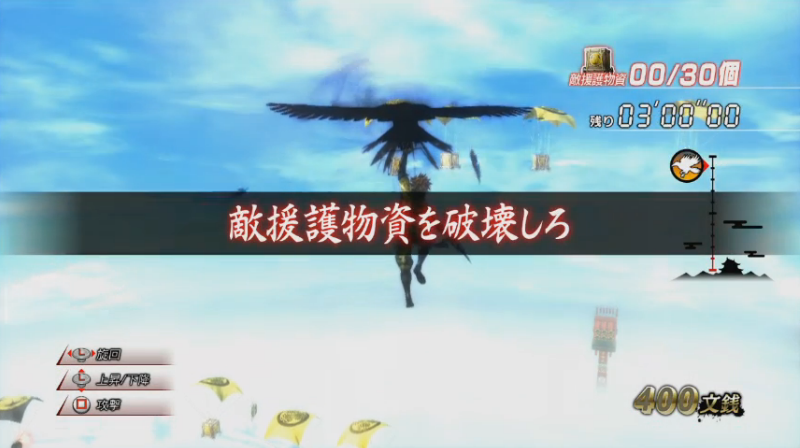 One other possible hint is that the Tegata Missions are always worded in a general way - instructions like 'defeat Hideyoshi' or 'defend the gate' - which means there won't be any gameplay problems with slotting other characters into the free mode stages, with the exception of the character-specific minigames like Sasuke's aerial sabotage mission. The mid-stage dialogue would obviously need addressing but given how little work would be needed to allow free character selection on story stages I'm almost entirely convinced that we'll get it. Let's see. The new information collected the new details revealed in Weekly Famitsu, with the advantage of much better pictures. I've made a small amendment to my previous post as the confusing magazine layout led to a mistake in the stage descriptions. 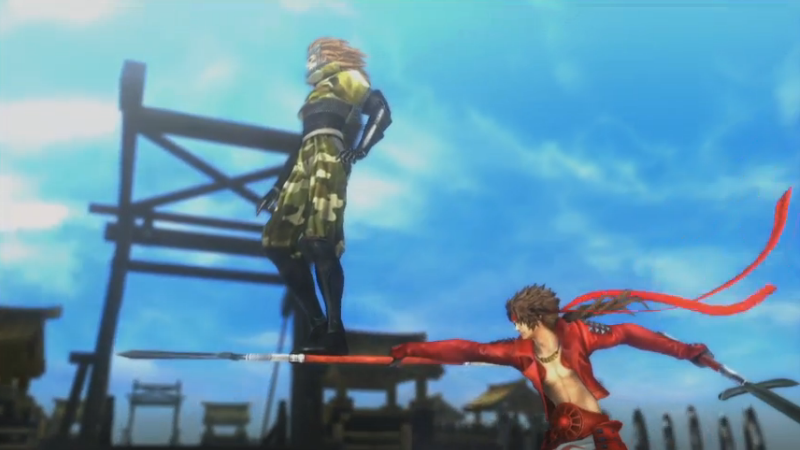 We also got a brand new promotional video showing the game's paid DLC costumes in action. The voiceover confirms that the removable heads for the Bontenmaru/Benmaru outfits are for cutscenes (there won't be any in-game headless mascot action). 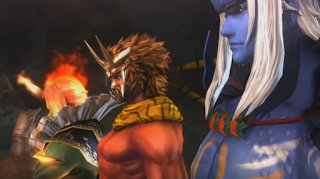 The oni costumes are loosely connected to the idea of the underworld; it's already been announced that the hardest difficulty level is named after the Sanzu River so there's an existing connection there. 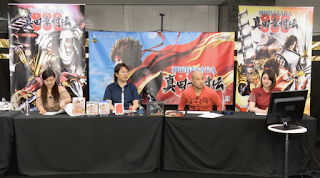 The last update was another tweak to The Action Of Sanada Yukimura-den 'making of' video section, with two new clips and interviews featuring director Tanaka Toshihiro and Sonomura Kensuke. 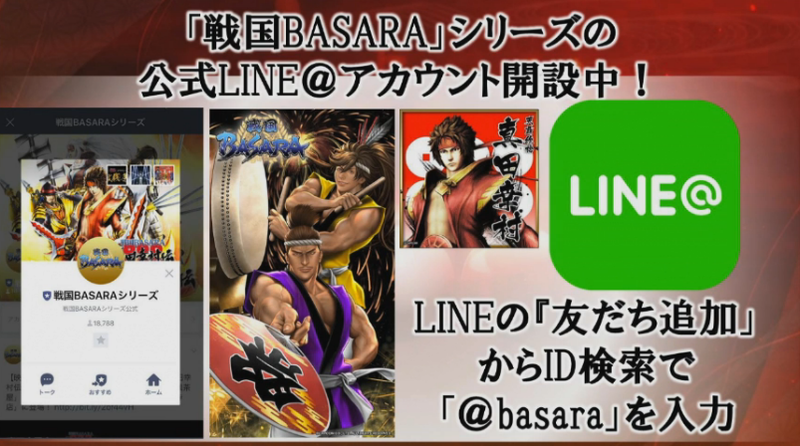 goo is a popular Japanese search engine and to promote the new game's release next week, it's currently displaying a Sengoku Basara: Sanada Yukimura-den theme on its front page. 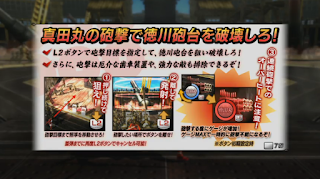 As well as the visuals, there's a large box on the front page which collects interviews, videos and articles about the game to help visitors learn more. 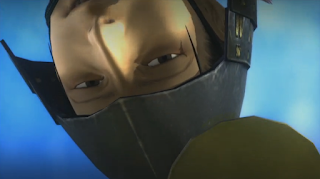 It's an interesting way to spread awareness about Yukimura-den. The latest in Ashigaru-kun's series of photo reports has been posted on the Tokusei Kawaraban site and it's all about a visit to the new Rokumonsen Cafe in Akihabara. I hope they never do things that way again! Anyway, this seems very fun! By the way, in "The Action of Sanada Yukimura-Den" videos, I noted two things: 1) It seems Nobuyuki killed Katsuyori(or allowed Katsuyori getting killed) in order to save Masayuki from Nobunaga. 2) Nobuyuki abandoned Masayuki and Yukimura and went to Tokugawa side right after First Ueda Battle!!?? That must hurt for Masayuki! (Although in reality, Nobuyuki did not go to Tokugawa side about 15 years later, a few days or weeks before Sekigahara). Thanks for picking up the error! It's corrected now. I'm guessing that Matabee is still reeling from his crushing defeat and working on his own at the start of the chapter, but later on his seething hatred for Masamune will fix things. The scene with Masayuki left behind was quite sad, even in the slightly silly documentary video! 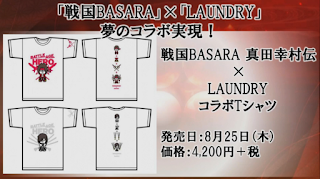 Haha, the Ranmaru jokes probably have something to do with the game being related to the Sanadamaru. Since both end in "maru" and all. My guess anyway. Yeah, it made sense for the Sanadamaru one but then someone kept the joke going for the next question (lol). That or there's a really dedicated Ranmaru fan out there. It's weird that we haven't even seen any teaser shots from it yet! If I get the Chinese version of the game but buy the dlc on a Japanese account, will I still be able to use it. Thanks in advance. I'm afraid I have absolutely no idea - this is the very first time they've done a localised Chinese version, and the first time since they started including DLC at all that they've done a non-Japanese release. There's a precedent for it working (Sengoku Basara 3 picked up the trophies across regions back on PS3 even though the languages were different, IIRC) but there's also a risk that it won't (Sumeragi's weapon DLC only worked on the exact PSN account where you purchased the weapons, even though the costumes let you switch accounts as normal). Having said that, if you're buying the Chinese version the Chinese DLC is likely to be identical and probably cheaper depending on your currency, so you might be fine just sticking with the Chinese version of everything, and Capcom is releasing both Chinese and Japanese versions in Asia so it will be easier for them if everything works interchangeably. It looks as though they're serious about supporting the Chinese-speaking fans this time so I'm guessing the Chinese version will get access to all of the same DLC as the Japanese-speaking fans. Hmm it's a hard one but I will take the risk , see if it works and report back just incase the question comes up again. Though my situation is complicated I won't get into it lool >.<. Thanksss alot though. Yh it doesn't work lol, it's sitting in my downloads saying waiting to install :/ Oh well. It might work on ps3 though.